Vernor Muñoz. 2009. The Right to Education of Persons in Detention. Human Rights Council, 26 p.
Davis, Lois M., Robert Bozick, Jennifer L. Steele, Jessica Saunders e Jeremy N. V. Miles. 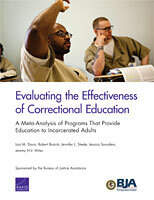 Evaluating the Effectiveness of Correctional Education: A Meta-Analysis of Programs That Provide Education to Incarcerated Adults. Santa Monica, CA: RAND Corporation, 2013. Também disponível na forma impressa. Christina Clark e George Dugdale. 2008. Literacy Changes Lives: The role of literacy in offending behaviour – A discussion piece. London : National Literacy Trust. 11 p.
Denise Carreira. 2009. Educação nas prisões brasileiras (português) / Educación en las prisones brasileñas (espanhol). São Paulo : Plataforma Brasileira de Direitos Humanos Econômicos, Sociais, Culturais e Ambientais (Plataforma DHESCA Brasil). 116 p.
Basic Education In Prison. Vienna : UNESCO Institute for Education, 1995. 204 p. ST/CSDHA/25.